In 1840 the Treaty of Waitangi was signed by representatives of the British Queen and leading Māori chiefs. Because the treaty was interpreted differently in the English and Māori versions, considerable debate emerged, particularly in the 1970s and 1980s. 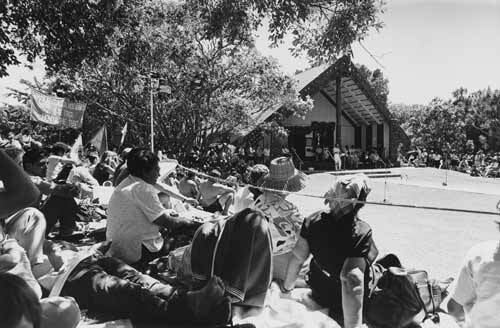 Protest groups were established, including the well-known Ngā Tamatoa and later Te Kawariki. Here Shane Jones of Te Kawariki addresses a crowd gathered on Waitangi Day, 1988.